Articulated Surface addresses the transfer of data from an ecological system to an installation. To re-conceptualize the network of information generated by the mobile hunting camp modules, the mobile responsive hunting camp module will be utilized to collect data throughout the Atchafalaya, to create a data visualization, dynamic art installation in the city of Baton Rouge, expanding the network of readable information. 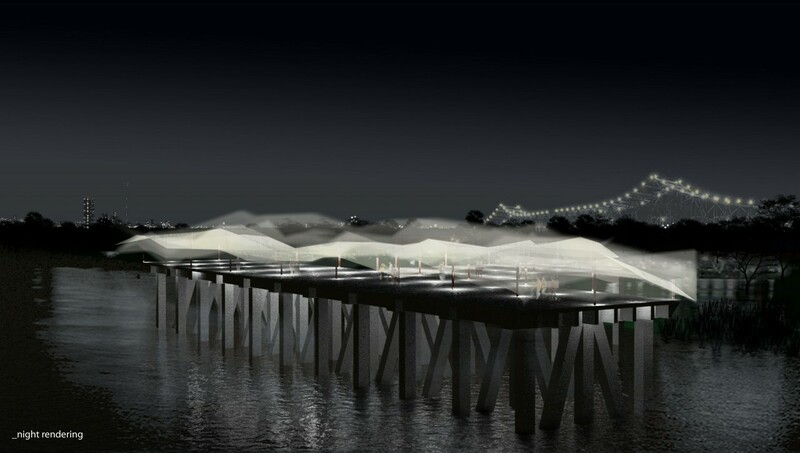 The design intends to represent a data visualization of dissolved oxygen [DO] content in real-time using a dynamic surface infrastructure and light system that responds to assigned variables in real-time. The modules collect data based off of research done by LSU professors, Kaler, Kelso, Halloran and Rutherford, ‘Effects of spatial scale on assessment of dissolved oxygen dynamics in the Atchafalaya River Basin, Louisiana,’ Hydrobiologia 2011. To determine factors [variables] contributing to high and low areas of dissolved oxygen, the modules would sense water temperature, river stage height, current velocity and water depth. Of these four variables, current velocity is the most significant in effecting the dissolved oxygen content. Although, these are the measurable variables for levels of dissolved oxygen, the physical changes throughout this morphological landscape creating these conditions are increased sediment deposition, reduced riverine inputs and altered floodplain circulation. Thus, resulting in low levels of dissolved oxygen and increased dissolved oxygen stratification, which are indicators of hypoxic and eutrophic conditions. To represent this transparent striation of dissolved oxygen content, we are proposing an interface to visualize the data in the Downtown area of Baton Rouge. The site is the old shipping dock just South of the I-10 freeway along the East bank of the river. 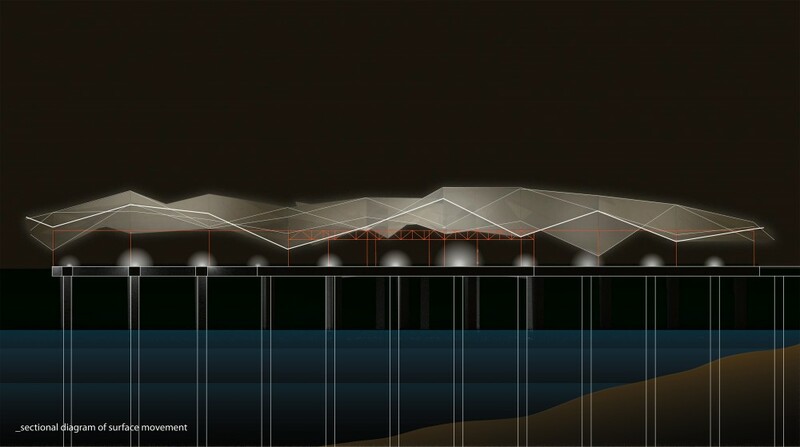 The existing infrastructure will be employed to support the dynamic surface made of translucent fabric. The horizontal surface is manipulated above, vertically by mechanics in response to water velocity and the lights would brighten and dim in response to changing levels of DO. The site is significant because of its relationship to the Mississippi River and the larger landscape. The annual flood pulse and water stage height is the primary constituent to levels of DO throughout the basin. A relationship can be drawn throughout the year by the height and form of the surface to the height of the Mississippi River. The translucency of the fabric overhead and its constant shifting movement would perform the effect of being underwater and experiencing aquatic conditions. The installation would respond to the variables assigned and lower or rise in reaction to levels of DO. In order to make the space relatable to urban methodologies, the space would be assigned movements that relate to socio-behavioral psychologies. Areas amplified by current velocity and higher levels of DO would create pathways of fluid pedestrian movement and larger open areas for gathering. Areas portraying lower current velocity and DO levels would sink to form low points in the fabric, creating areas that are not navigable or inhabitable and would obstruct movement. The temporal movement would reflect slight day-to-day changes but would be more representative of seasonal changes especially during annual flood pulses when there is a large influx of oxygenated water. The deviations of the surface would be the most noticeable from within the space but also legible from a distance. 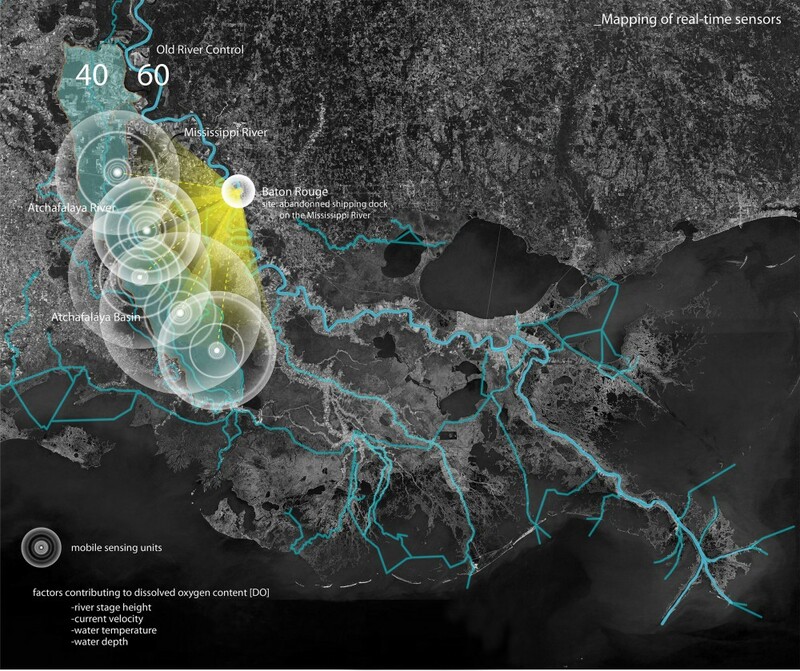 This data visualization dynamic installation would be an ambient space that people visiting, living or working in Baton Rouge could experience the environment on different levels. A relationship would form between the state of the structure and the time of day, time of month, seasonal changes, flood pulses and water stage height. To achieve the mechanics of manipulating movement of the surface, miniature servo motors were used to turn gear wheels that in turn moved rods in the vertical direction. Stocking mesh was attached to the bottom ends of the rods to form a grid to attach the surface. As a representation of the sensing technologies that would be utilized, light sensors were used in order to control the dynamic model. Each individual sensor drove a particular servo motor. The sensors were laid out onto a board to create a sensor field which users could run their hands over to create a shadow effect over the sensor which in turn moved the servo motor. A field of LED lights were aslo driven by the light sensors. The brightness of the lights change in relation to the data input from the light sensors. This effect would allow the surface to become visible during the evening and accentuate areas of high and low dissoled oxygen content.